What are the correct ends for this cable? BEST ANSWER: It depends on how your going to use the cable. If you are running them as a network in your house or office then on one end you will need a keystone connector that is made for cat 6 cable and that keystone will snap into the wall plate once you connect your Cat6 cable to the keystone. This would be the end that your PC or TV would plug into the wall for the ethernet connection. 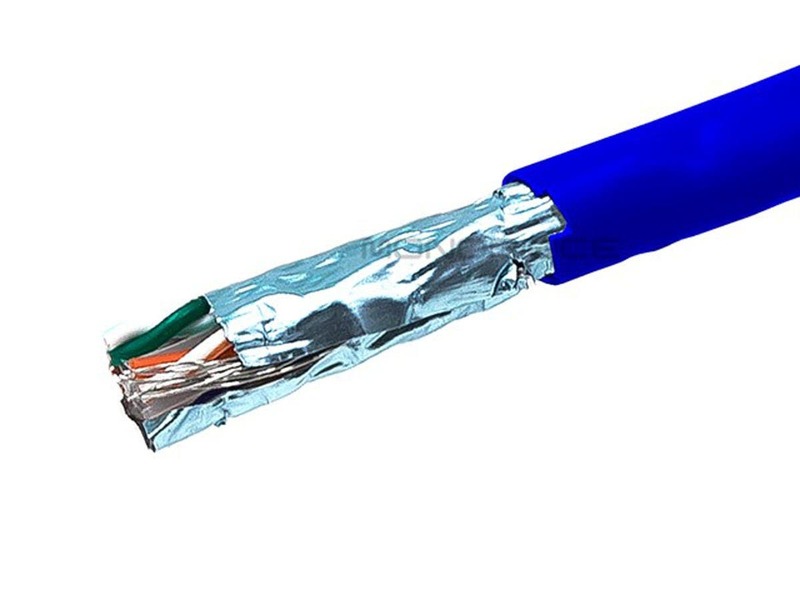 The other end if you want to plug it directly into a patch panel or switch then you would need an RJ45 ethernet cable connector that would have to crimp onto the other end in order for it to plug into the switch, router or patch panel. You could also use the extra cable to make your patch cable that would plug in between the device and the wall which you would use the RJ45 cat6 ethernet connectors on both ends. 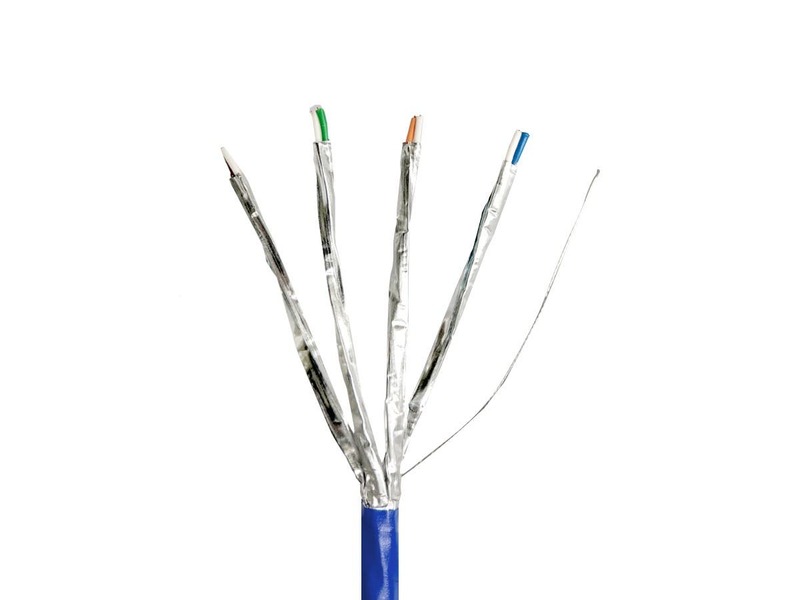 Any standard CAT5 or CAT6 end will work. You'll need to lookup the correct wiring pattern online. Just a side note, this wire is pretty stiff. It's great to run through the attic and walls but not from the wall to the device. I'd suggest terminating it into a wall plate. 1. what is the total weight of the shipped box? 2. does it still ship without a spool, as mentioned by some reviewers? 3. in a reply from monoprice, it was mentioned: "Hello, thank you for your review. Keep in mind you must use a solid plug for a solid core cable as regular stranded will not work properly." - do u have recommendation for a "soild plug"? Approximately how many twists per inch? Definitely heavy duty cable and great for difficult wall pulls. Solid colors are fine; however, there is no stripe on the others, so I have four completely white wires. This makes conventional plugs nearly impossible to crimp on. The pass-through rj45 plugs sold on monoprice will not work for these cables. Good deal on in wall rated cable. Used this several times, no problems. The insulation is thicker on the last box I bought. So far the box is holding up, but will probably need to be taped up like the last one. This cable is well shielded and tough. It's a bit thick, but not too hard to work with. Highly recommended for long permanent runs. Read other reviews about the Box. Taped it up wih fiber tape, no problems, pulled well, no kinks. Worked as advertised. Will use again. The cable is nice. Does what it needs to do. We conduit pulled several runs of this for Audinate Dante digital audio "tie lines" in a church gym. It pulled nicely (we used a little Ideal ClearGlide) and was easy to terminate. Works exactly as it should. The box this ships in, however, is horrible. Beyond horrible. I picked it up by its handle and it fell apart. Not the first time this has happened with MP cable. Plan on spending an hour or so untangling the whole mess so that you can wind it onto a real spool. We were on a time crunch, otherwise I would have paid a little more and ordered a different cable that I know for a fact ships on a spool. CONS: Does not ship on a spool. Ships coiled in an awful box which will cause you to invent new swear words when it breaks and you have to untangle the whole mess. Did I mention that this doesn't ship on a spool? The wire itself is fine. The box is too flimsy. The feed horn was broken in shipping. The box is too thin to handle the weight of 1000ft of this wire.